It’s almost time for South America’s biggest banking event of the year: CIAB FEBRABAN in Sao Paulo, Brazil. Over the next three days, thousands of representatives from banks and related industries throughout Latin America will converge to talk about key topics and developing trends in banking and payments. 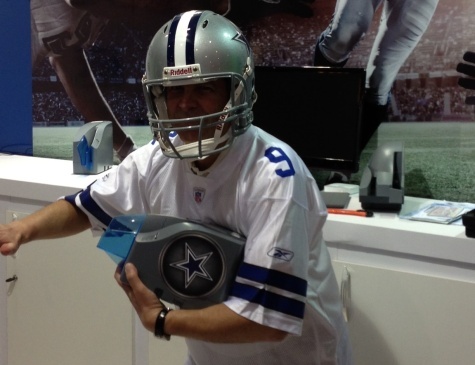 I know the first thing that those of you who follow American football are wondering: Why the Dallas Cowboys? 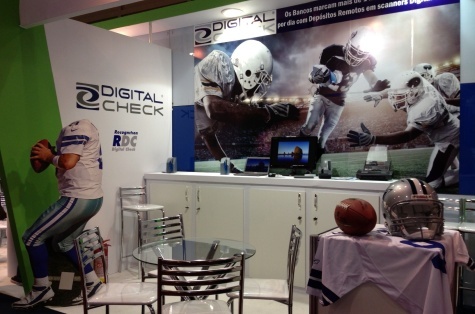 Digital Check is based in Chicago — and that aside, if you were to use Cowboys gear for your booth decorations in the U.S., you would instantly have one of the most divisive booths on the show floor, thanks to the passionate love/hate relationship that exists with that particular team. Well, as it turns out, the Cowboys, along with the Miami Dolphins, are one of the most popular NFL teams among Brazilians, so it’s a much less polarizing theme than if it were on display in, for example, Philadelphia. It also doesn’t hurt that Dallas is probably one of the three or four NFL teams that even most casual international fans would recognize. So this was a rare chance to use a football-themed tie-in, without a lot of conflicting rooting interests coming into play. Another reason for using them as a backdrop is a lot less exciting: As luck would have it, the Cowboys’ blue and gray are almost identical to the blue and gray we use in our own logo. In a way, it’s kind of like what might happen if a South America company exhibited in the U.S. with a soccer theme. Everyone would recognize the theme and associate it with Latin America, but few of us in he U.S. would have a strong negative reaction to a jersey from Santos or Boca Juniors. (By the same token, some of us might recognize, say, a Manchester United jersey, but it still wouldn’t cause the same reaction in Chicago as it would in Liverpool). Perhaps surprisingly, given the huge popularity of soccer in Brazil, American football has been gaining a following here. There’s no organized professional league like the NFL, but there exist teams and leagues with varying degrees of formality, and an annual championship, the “Carioca Bowl,” has been held for the past several years. When the first few brave souls started playing American football in Brazil some 25-odd years ago, very little equipment was available — only mouthguards and the footballs themselves — so the game was adapted to be played on beaches, which were a bit more forgiving to be tackled on. A lot of football games in Brazil are still played on sand, although it has taken to turf in many cities without beaches, and in recent years, the first games with full pads and helmets have been played. Below is a picture of yours truly having some fun suiting up at the booth on Tuesday afternoon. We’re looking forward to seeing what happens when the show action starts tomorrow!